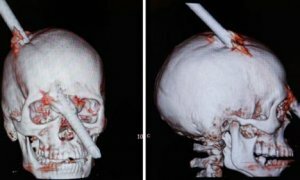 I don't really like talking about jobsite injuries as they are often painful to read about and see, but it is not everyday we hear about a man surviving getting impaled with an iron bar that passes completely through his head. The 24 year old construction worker had the unfortunate luck of being hit by an iron bar that fell from the fifth floor of a building that is under construction in Brazil. The man was wearing a hard hat, but it was not enough to stop the bar from piercing through. As odd as this may sound, the bar did not seem to damage any part of the brain that is of great importance, and besides some pain, the workers is doing well. Read the full story here if you wish, but I am writing about this more to talk about jobsite safety. Even if you follow all of the safety procedures, you still have to worry about the actions of others. It is always a good idea to know the type of work people are doing around you, especially if people are working above you. Be aware so that if you see someone doing something wrong or dangerous you can get away. How much is your personal safety worth to you? The man was wearing a hard hat but it did not have enough strength to stop the projectile. Did you know hard hats expire? The expiration varies depending on the manufacturer, but the typical expiration date on a plastic hard hat is five years. All those temperature extremes of being left out in your truck, as well as the exposure to the suns UV rays really takes a toll. You could always buy a better hard hat. Metal hard hats have been banned due to electrical hazards, but there are other stronger alternatives. For my protection I use a Skullgard Hard Hat by MSA. The Skullgard is made out of a fiber material that has been hardened with a resin, almost like kevlar. I don't know how well it would do against a bullet, but I know it would do better than the plastic would. Skullgard hats have been around for decades, I actually have one from the 1940's (?) that belonged to a family member, and other than the suspension system, it looks as good as the one I use. A full brim Skullgard costs around $75 and the cap style costs around $70.